Saints have lost one of its favourite sons with the sudden death of former full back Geoff Pimblett. Club historian Alex Service has paid his own personal tribute to an ex-player who shared in many of St Helens triumphs. Born in the Laffak district of St. Helens, Geoff Pimblett showed he had tremendous sporting ability as a pupil at Windle junior school and later at Cowley Grammar School. He had tremendous hand-eye coordination and was a natural games player. Even then it was obvious that he was cool under pressure and was rarely, if ever, flustered. Although he was a quiet, somewhat reserved character, he had a total belief in his own ability that could never be described as arrogance, which every successful sportsperson has to have. In rugby and cricket, he continued to flourish and by the late 1960s, he was an integral member of St. Helens RUFC and had picked up county honours, for Lancashire, in the process. In the summer months, he was a deadly fast bowler for St. Helens Cricket Club and also represented the Manchester Association. Many good judges reckon he was one of the quickest bowlers never to play for his county, but I digress. He was never the biggest of players and his anticipation and timing had to compensate accordingly – another reason he was to achieve so much. What they got was an astute and intelligent footballer, with a nimble step and the ability to chime into the attack with deadly effect. It seemed as though his football brain was several notches ahead of his opponents and he made things look easy, such was his natural ability. He appeared to be so organised and unflappable, in command of most situations, whether in defence or attack. Geoff was also a fine goal-kicker, with a precise, chipped style, like a golfer with a nine-iron and could pop over crucial drop-goals if need be. Geoff was 26 when he became a Saint on January 7 1971 and a change of codes was always a potential gamble. He played several games in the A team as a stand-off and was the back substitute for the visit to Whitehaven on February 27. “You have to have some luck in the game and I remember the team got knocked out of the Challenge Cup by Leeds and perhaps it was then that they thought about giving me a chance to establish myself,” he recalled. He wore the full-back’s jersey for the first time against Wigan on Good Friday at Central Park, with the Saints winning 9-6, in front of 24,017 and by the end of the campaign, 12 matches in fact, Geoff was playing a vital role in another Saints’ success over Wigan, at Swinton in the Championship Final, when they kept the trophy for the second successive year. He looked the part in the number one jersey too. He made a sterling contribution towards Saints’ success in the 1972 Challenge Cup Final victory over a powerful Leeds side and was a virtual ever-present in the team that won the First Division Championship in 1975 at a canter. Yet it is the 1976 Challenge Cup Final that saw him produce his greatest performance. 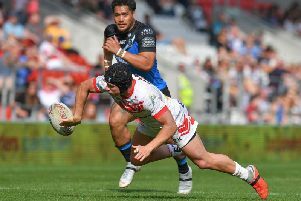 Despite the intense heat, Pimblett revealed why he was such an asset to the Saints, with three conversions and two vital drop-goals as his ‘Dad’s Army’ side held their own – and more – against a much younger Widnes outfit. He was a constant threat to the Widnes defence all afternoon doing what he did best – linking up with the attack. It was a superb all-round performance worthy of the coveted Lance Todd Trophy. The Saints, with Geoff in sparkling form, retained the Premiership trophy in 1977, with the 32-20 defeat of Warrington. Pimblett’s marvellous seven goals and a try earned him the Harry Sunderland Trophy outright, when, almost like an extra stand-off with his deceptive, jinking running style, he created wholesale panic in the opposition ranks! By this time, despite his relatively slight frame, he had also perfected a superb front-on ‘man-and-ball’ tackle. Not many got past him! He was more durable than many realised. Geoff became a ‘dual-code’ county player with his selection for Lancashire against Other Nationalities at Knowsley Road on November 25 1975, at right centre. He played once more, two years later, in his more accustomed full-back position, against Yorkshire at Naughton Park, Widnes. He also achieved a long-standing ambition by playing for England against Wales at Knowsley Road on May 28 1978. England won 60-13, the widest-ever margin between the two countries, yet Geoff delighted his supporters with a fabulous 21-point performance, nine goals and a try, a record for an England player at the time. Ironically, this was later broken by another Saints’ full-back, Steve Prescott, in 1996. The 1978/79 season saw the Saints in relative decline, although the side battled through to the semi-final of the Challenge Cup against Hull KR. After a string of bad results, the unthinkable happened and Geoff was dropped before the game. The team itself had not been playing well in the run up and supporters thought that Pimblett had been made a scapegoat, especially when Saints lost 9-7 and he could have made quite a difference. Geoff was a brilliant history teacher at Grange Park High School, where another Saints’ great, Steve Llewellyn, was Deputy Head. He was a supremely organised person, an engaging personality and so well-respected by pupils and staff alike. When Grange Park became Broadway, he was Senior Master and remained a popular figure until his retirement in the mid-1990s. A devoted family man, and married to Merle for more than 50 years, they have two daughters, Helen and Janet; five grand-children, Jarrod, Josh, Keeley, Hollie and Chloe, together with two great grandchildren, Zak and Eli. Indeed, his grandson Josh [Simm], has recently returned from the Saints’ Academy tour to Australia and, hopefully, has a great future ahead of him. Geoff was so proud of the progress he was making. St Helens has lost one of its greatest sons and we extend our sympathy to Geoff’s family at this sad time.